Take a break from all the holiday hustle and bustle and indulge in our cookie-themed Read the Revolution! Anne Byrn’s latest cookbook, American Cookie: The Snaps, Drops, Jumbles, Tea Cakes, Bars & Brownies That We Have Loved For Generations, mixes sweet treats with history take you on a journey through America's most beloved confectionaries. 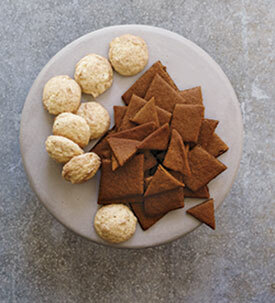 The following little morsel from the book highlights a classic American cookie–the gingersnap. Enjoy! The spicy gingersnap truly snaps when you break it into pieces. And real gingersnaps, the old-timers say, contain no eggs, plenty of butter, and molasses that has cooked down on top of the stove. The first mention of gingersnaps took place around 1805, according to John Mariani in The Dictionary of American Food & Drink, although cooks were baking gingerbread long before then. What we call gingerbread cake and gingerbread cookies today were parts of the collection of "gingerbread" recipes baked in Colonial America. The oldest examples were hard gingerbread pieces pressed with a decorative pattern using a stamp. These early ginger cookies originated in Europe and came with the German, Dutch, and English settlers to America. Gingersnaps were named from the German or Middle Dutch word snappen, meaning "to seize quickly." In the United States, gingersnaps were associated with Muster Day or Militia Day, a military training and social event the entire town attended. Food historian Betty Fussell says that after the Revolutionary War, America realized the importance of a town militia for protection, and on Muster Day after the new recruits were signed up and the drills took place, there was plenty of rum to drink, gingersnaps to eat, and games and festivities to enjoy. The following method for making gingersnaps might seem odd. You thinly roll the dough and drape it onto a pan before baking. Then, while still warm, the cookies are cut into strips and diamonds with a pastry wheel or pizza cutter. Nothing is wasted-there are no scraps from cutting out rounds of dough to bake. It's resourceful and fast-an old technique that works with busy lives today. Place the brown sugar, molasses, and butter in a large saucepan and heat, stirring constantly, over medium-low heat until the butter melts, 5 to 6 minutes. Remove the pan from the heat and stir well to combine. Place a rack in the top third of the oven, and preheat the oven to 350°F. Set aside a 17½" x 12" baking sheet. Remove the dough from the refrigerator. Sprinkle the rolling pin and work surface with flour. Place about a third of the dough on the work surface and roll the dough ⅛" to 1⁄16" thick. Loosen the dough from the surface using a thin metal spatula. Carefully wrap the dough around a rolling pin and lift it onto the baking sheet. Unroll the dough so that it is centered on the pan. Place the pan in the oven. Bake the dough until it is browned around the edges, 11 to 13 minutes. Remove the pan from the oven, and allow the dough to rest on the pan for 2 minutes. Using a pizza cutter or sharp knife, cut the dough into strips or diamonds. Let the gingersnaps cool on the pan for 10 minutes. Break apart the snaps and place them on a wire rack to cool completely. Repeat the process, rolling another third of the dough onto the cooled pan, bake, score, and cool. Repeat with the final third. Store the cooled cookies in an airtight metal container for up to 2 weeks.